I'll admit that we were our own worst enemies on this. 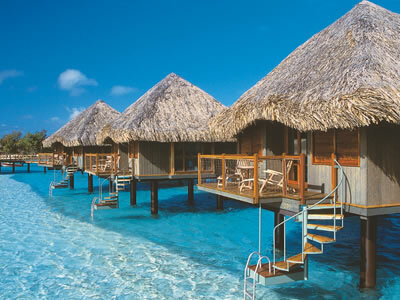 First, we wanted to do something exotic and unique among our friends and go to Tahiti or Bora Bora. Seriously, when you see something like this, doesn't it make you just want to run away and never come back? When we started looking into it, we loved it, but it didn't quite fit our budget for right now. We're trying to keep it fairly low key, especially right after the wedding, with a plan to take a much larger trip on our first anniversary. Second, we checked into Hawaii, and it was absolutely beautiful, but a part of us worried that we'd get the same feeling that we have in Myrtle, with the extreme commercialism centered around tourism. Also, to be truthful, it would have been do-able on our budget, but not in the way we wanted it to be. This really helped us narrow down locations. Want to know where we'll be heading? Stay tuned!